Focus on what is really important: SmartGit/Hg will ask only when it needs a decision, but doesn't bother you with underlying technical constraints. 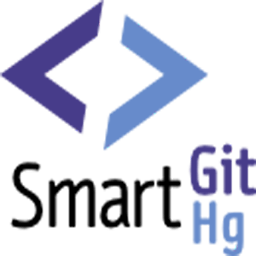 There is no need to install and configure additional tools: SmartGit/Hg comes with a built-in SSH client, a File Compare and 3-Way-Merge. Reorder commits before pushing, commit individual lines within a file, resurrect lost commits and many more. Use SmartGit/Hg for Git, Mercurial or SVN. On Mac, Windows and Linux. Purchase once and use on all of your favorite platforms. Clone from GitHub, Assembla and other hosting providers. Identify team-mate commits by their gravatars. See your repository state at one glance: your working tree, Git's Index, available branches, which commits need to be pushed. Git-Flow is a high-level command set wrapping low-level Git commands to support a successful branching model. For the user it significantly reduces the necessary workflow steps and hence reduces the risk of incorrect command usage by less-experienced users. The performance of rebase operations, especially on Windows systems, has been significantly improved (18x faster on a Windows XP test machine). SmartGit supports an own URI: smartgit://cloneRepo/. This allows web applications like gitblit.org to easily trigger a clone in SmartGit/Hg. To reducing the risk of overwriting changes using a forced-push, a safety check is performed ensuring that the local 'remote' branch is identical with the one in the remote repository. In other words: the forced-push is rejected if someone else has pushed something to the same branch. You have to perform a fetch first (and get the other user's changes) to successfully perform a forced-push. If the application fails to start, e.g. because you have an incompatible JRE version on your system, it might be necessary to set the SMARTGITJAVAHOME environment variable to the root path of the Java Runtime Environment 1.6 from SUN. To create an icon on your desktop, you'll find suitable images in different sizes in the bin directory.